Reniya Columbus scored 13 points and Maddie McConnell 12 but the Lady Eagles dropped a 49-48 decision to Marian. The team is now 5-5 overall and 3-4 in the NIC. The JV game was won 33-20 by the Lady Eagles. 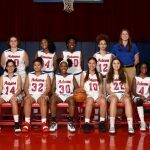 The Freshman Lady Eagles improved to 4-1 on the season after a 40-14 win over Riley Monday night. Lauren Higginbotham had 9 points and McKenna Leichty 6 points. Kyah Walker had 6 clutch points to lead the Freshman Girls to a 22 to 17 win over Goshen Saturday. The Lady Eagles are now 3-1 on the season. Reyina Columbus scored 12 points and Maddie McConnell had 10 as the Lady Eagles beat Bremen Friday night 57-39. The Lady Eagles are now 5-3 overall and 3-2 in the NIC. Reynia Columbus scored 16 points and Sam Jankowski 10 as the Lady Eagles beat Wawasee 44-36. The Lady Eagles led from Start to Finish . The Eagles are now 4-3 overall. in the JV game the Lady Eagles dropped a 39-27 decision. The JV team is now 1-6 on the year.